Friendly elves or angels crop up as hard-working helpers with both the Christ Child and Santa Claus in many portrayals of Christmas. However there are also punitive, sometimes even almost scary looking characters. These characters originally appear together with the main character bringing gifts. In some places, though, their traditional story has become so independent that they have their own separate day and wreak “havoc” without the main character. The birch rod, which is characteristic of many of the gift bringer’ companions, originates from pre-Christian fertility rituals as the seemingly lifeless twigs carry the greenery of the future. So being struck with it did not initially mean a punishment but was considered to be a kind of blessing. It was only in the 19th century that the birch rod was associated with an instrument of castigation and the “evil” characters in customs. 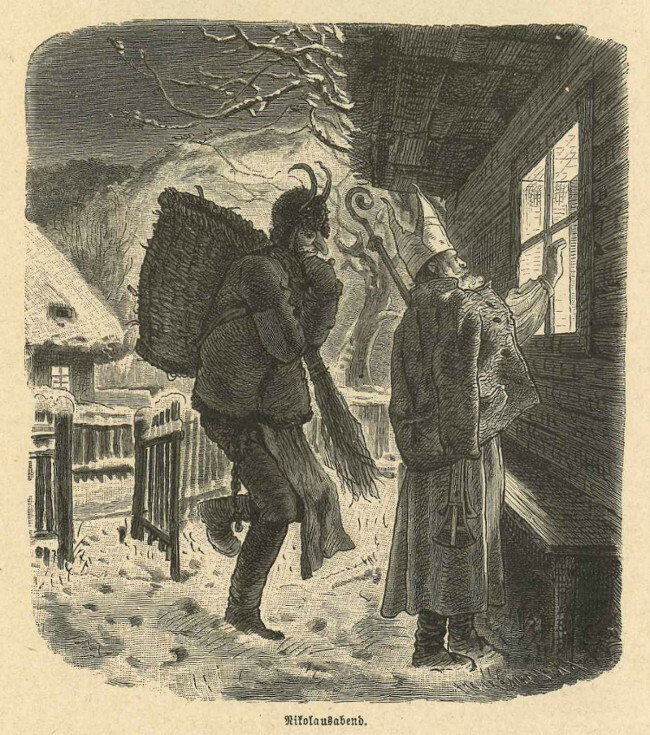 The “Knecht Ruprecht” character is popular and depicted as totally normal as well as scary looking as Saint Nicholas’ companion. 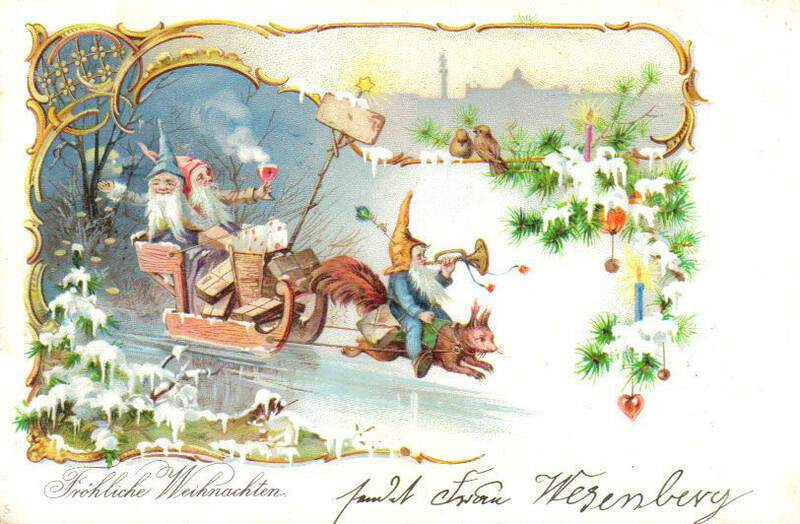 There are regional differences where he is alternatively known as “Knecht Nikolaus”, “Nickel”, “Pelznickl”, “Hans Muff” or “Hans Trab” (also “Hans Trapp”) He went from house to house in fur-trimmed clothing with a birch rod and sack in his hand. In the sack were both toys for the good children and pieces of coal for the naughty children. As the custom developed, this assistant regionally became an independent gift bringer as a “representative” of the main character. The “Krampus” is considered to be an embodiment of winter demons or in fact the devil and is a purely punitive and/or scary character. That is why he is usually portrayed in shaggy fur with the cloven hooves of a goat and horns. His colours are red and black. Besides a birch rod or a stick he also often carries chains as a prop. The “Krampus” character is mainly famous in southern Germany, Swabia and the Alps region. He acts as the counterpart to Saint Nicholas disciplining the children and only acts on Nicholas’ direct instructions. Being castigated with the birch rod and abducted to an unknown place were intended as sanctions. The “Klaubauf” is also a masked companion of Nicholas often called the devil, who takes naughty children away with him in popular belief. He appears during the Advent period in particular in Upper Bavaria and North Tyrol. Folk etymology derives the name “Klaubauf” from “aufklauben” (= taking away) children. The “Hans Trapp” character goes back to a Grand Elector of the Palatinate’s administrative court official who was called Hans von Dratt. He tortured the farmers under him so badly in the 16th century that he found his way into customs in southwest Germany as the companion who scares children.